We are selling various types of bags,and focused on original design,superior material,exquisite sewing and excellent services.Every customer is our friend,we hope you are satisfied and happy when carry our products. There is 1 x big zipper pocket in front and 2 x open side pockets.It is quick access to get cup bottles,umbrella,changes and frequently used items. In addition,we added a key ring and fixed on inner pockets,easy for you to take out keys. With the ideal size for all of your belongings, perfect for the office, travel ,shopping or daily life.Stylish and Practical.It is a great gift for women,wife,girlfriend and everyone you love. Application:Business/Travel /College /Casual /Outdoor / Hiking / Shopping ect. -- The actual color maybe slight different from the picture shown due to the different screen of display or reflecting light when shooting. -- 0.5 - 1 inch error of measuring is a reasonable range due to different measurement methods. -- If you are not satisfied with your purchase,please let me know.Offering superior products and excellent service is our lifetime pursuit. Main compartment with various types of pockets,It is spacious for clothes,magazines,personal folders,phones,wallets,keys and other daily items.All stuff is well organized,easy to find what you want. Using washed canvas and polyester fabric lining,anti-tear and durable.Handle and bottom are made of microfiber leather,which is lasting long and strong. With rivets and leather decorations,it is good-looking and modern.There are 2 extra leather mats at the bottom to protect the bottom from abrasion. 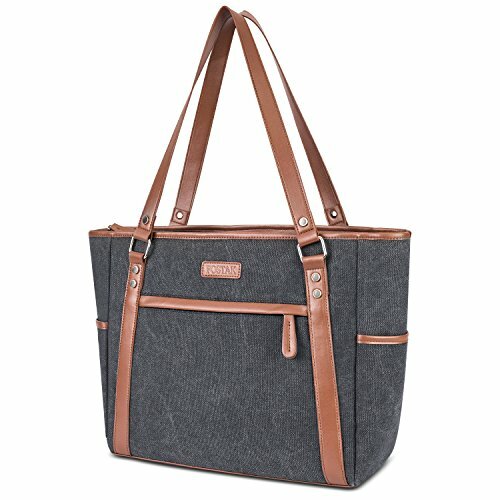 This is a practical and muti-functional bag,you can take it for work/ school/ day-trip/ hiking/ daily going out.It is a great gift for women/ wife/ girlfriend and everyone you love. If you have any questions about this product by Suppets, contact us by completing and submitting the form below. If you are looking for a specif part number, please include it with your message.